Foster Township, a peaceful farming community, typical of America's mid-west. Fields full of waving seas of grain and tall stocks of golden corn, thick forests crawling with deer, turkey, rabbits and raccoons. Flat prairies and rolling hills and people who care for each other. It is located in the northern part of the county of Marion, bordering Fayette County on its north, Kinmundy Township to its east, Tonti Township on its south, and Patoka Township to its west. Township 4 North and Range 2 East. Before the township received the name of Foster, in honor of Hardy FOSTER, the first European settler of the township, it was known as North Fork Township. Hardy FOSTER moved to Foster Township form Georgia, settling, on Section 17 in 1823 and removing later to Section 8, where he built a cabin on the Vandalia-Salem State Road. He opened a stagecoach stop there, it being about halfway between the State Capital of Vandalia and the county seat of Salem. It was 14 miles north of Salem on the road and 6 miles northeast of Patoka. Fosterburg was located on the west 1/2 of the northeast 1/4 of Section 8 in Foster Township. The land was owned by Hardy FOSTER and the village was laid out by hom on the 6th of March, 1854 and surveyed by County Surveyor, William Marshall. The plat was recorded the 10th of March, 1854. 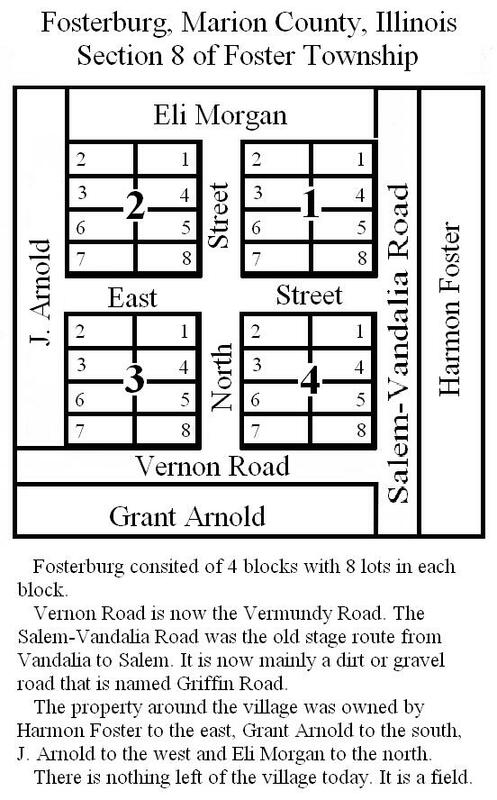 It consisted of four blocks, each containing eight lots. The town was originally given the name of Fosterburgh, but officially recorded as Fosterburg. The post office had been established in 1833, which lasted until the late 1870's. Hardy FOSTER also put in a horse mill in 1833, which he ran until 1850. Samuel B. JONES, William EAGAN and Andrew H. FOSTER, who was a nephew of Hardy, put in a sawmill in 1853. Fosterburg soon turned into a prosperous little village with great potential. The first general mercantile was put in the home of William DOOLEN in 1854, who was the eldest son of Irish immigrant Daniel DOOLEN. James ARNOLD and William RITTER put in a second mill. Later merchants were Samuel B. JONES, Thomas S. JONES, Daniel McCONNEL, J. W. ARNOLD, among others. Dr. William WHITE was the first physician of Fosterburg. The village also contained a Methodist-Episcopal Church and a school. The school had as many as 50 students in 1859. The village had twelve homes in its peak, two physicians, three General Mercantiles, two mills, a photo-gallery of the tintype, blacksmith, wagon shop, stage stand, Fosterburg School and Fosterburg Church. The death blow for Fosterburg came as a result of the railroad passing it and instead going through what became Vernon and Patoka. Also, the main road no longer passed through Fosterburg. The post office was closed in Fosterburg and opened in the hamlet of Lester, a few miles to the east. It was located in Section 10. At the crossroads of Vermundy and Jones Roads. Lester had a nice two-story general mercantile. 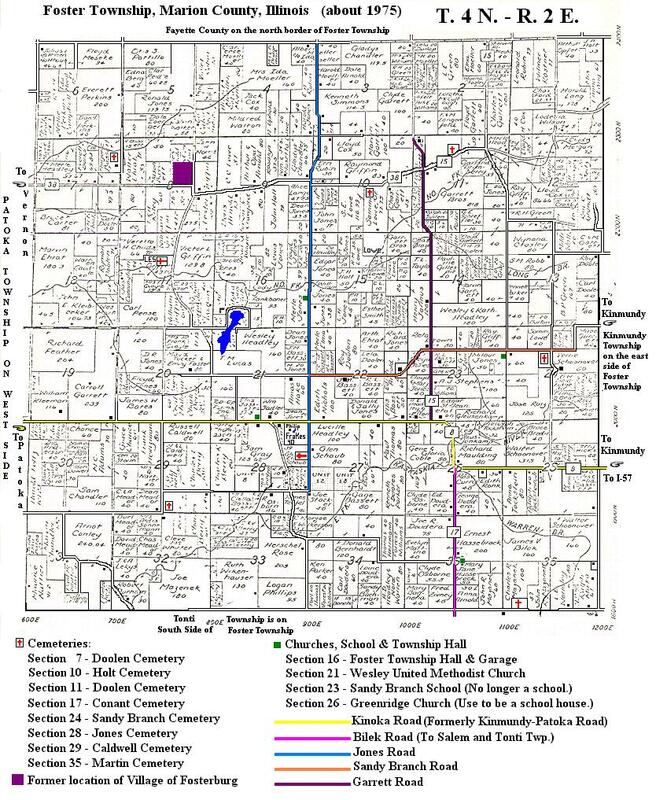 Lester also had Arnold Chapel (a Methodist-Episcopal Church, North) and Arnold Chapel School. All that remains of Lester in 2003 is a single home and the sign that says "Lester." The church burned down in 1960 and the school was torn down after years of non-use. The second family to settle in Foster Township was that of The "Widow"Mary (WHALEY) JONES, whose many Jones descendants still live in the township. They first settled on Section 18 in 1826, from Georgia. The Moses GARRETT Family came in 1826 from Georgia, settling on Section 10. He was known as "Squire" GARRETT. He was Justice of the Peace. Many of his descendants are still living in the township in an area known as Garrettsville, on Sections 10 and 11. Isaac NICHOLS settled in 1830 on Section 29, later called the "Caldwell place." Mordecai SMITH came from North Carolina in 1831 and settled near East Fork Creek. Thomas MOON in Section 16 from New York was the first teacher in the township. Mark COLE, Jonathan GREEN, Jesse and Daniel DOOLEN all settled in 1836. Ross JONES settled one mile north of East Fork Creek on the Vandalia-Salem State Road. Airs CONANT settled on Section 11 after having first lived in Patoka Township, where he was the first Justice of the Peace and first schoolteacher in the township. He was an educated man, soldier of the War of 1812 out of Georgia, but originally from New England, descendant of Governor Roger CONANT, First governor of the Massachusetts Bay Colony. Airs taught a subscription school in Foster Township. John ARNOLD settled in 1844 and built a horse mill on East Fork Creek on the Kinmundy-Foster Township line. Three MORGAN brothers, Benjamin Arnold MORGAN, John Barb MORGAN and Wesley Deskin MORGAN came in the 1840's as boys to the county. They left Alabama and came to Foster Township to live with their cousin, Frances (ATKINS) ARNOLD, who was the daughter of Mary (MORGAN) ATKINS, their father's sister. It was said that B. A. and J. B. were extremely opposed to slavery. W. D., however, returned to the south and fought for the Confederacy with his brother George during the Civil War. The McWHIRTER, family began settling here in the mid 1840's from Wilson County, Tennessee. Some of the family settled in Foster Township and some in Tonti Township. Most all of the settlers of Foster Township were southerners. One of the exceptions was the BASSETT family, who came from Indiana settling on Section 22 in 1858. Harvey Foster BASSETT was the son of Elisha BASSETT, JR. of the prominent New England Bassett family. During the dark days of the Civil War (War Between the States) all of the citizens of the township rallied to the flag of the Stars & Stripes, southerner and northerner alike. They all fought bravely to see that the Union would endure into the future for all mankind. The first birth in Foster was that of Sarah "Sallie" FOSTER in 1824, daughter of Hardy and Mary (JONES) FOSTER. Sallie married William DOOLEN in 1840. The first death occurred in 1827, that of Elizabeth MORRIS, age 18, daughter of Thomas and Elizabeth (JONES) MORRIS. The first marriage was that of Elizabeth JONES, daughter of the "Widow" Mary (WHALEY) JONES to John F. HOLT, son of Harmon HOLT, who was the first settler of Patoka Township. In a later immigration to Foster, the township received a group of immigrants from Bohemia. They settled in the southern part of the township, south of East Fork. Among these people were the DOUDERA'S, ROLLER'S, JEZEK'S, BILEK'S, PALANKA'S, MAZANEK'S, HOWDA'S, KOTRA'S, SKOKAN'S and LODKA'S. Many of them are still in the township. 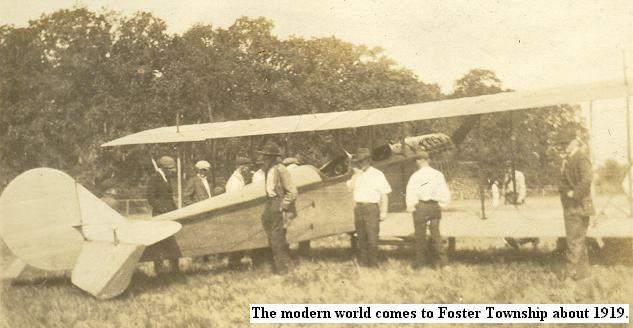 Most of the people of Foster Township today are descendants of the original settlers. Among them are: BASSETT, BRIMBERRY, COX, DOUDERA, FRAKES, GARRETT, GREEN, GRIFFIN, HEADLEY, HICKS, JACKSON, JONES, KLEEMAN, KLEIBOCKER, LOWE, LYBARGER, MUELLER, PERKINS, SCHAUB, SCHOONOVER, SHULER, STEPHENS, TOCKSTEIN, THOMAS, WILLIAMS and others. At one time there were 802 male voters in Foster Township. In 1991 there were 160 total voters, men and women. 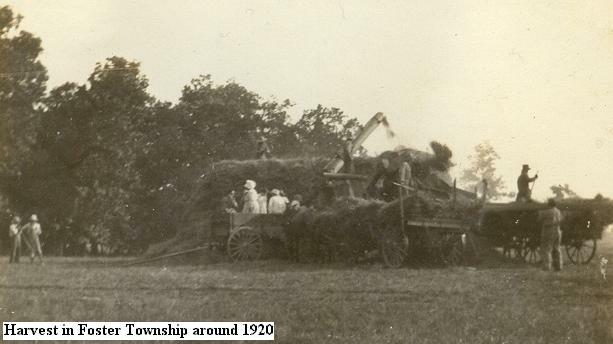 From its very beginning, Foster Township has been a farming community. Corn and wheat being the main crop. Livestock was also essential to the lives of those living in Foster Township in the early days. Most farms would have both beef and dairy cattle, chickens, pigs and would also have horses for both farming and riding. From about 1920 thru the 1960's, Gage BASSETT had a large sheep farm over on Greenridge Road. The Doudera's had a dairy farm on Bilek Road. The Jones brothers had a few pig farms on Jones Road. The Muellers Farm was the place to go get eggs when I was kid. They lived at the north end of Jones Road, just before you go into Fayette County. There were also many orchards in Foster Township, but today, 2004, there are none. The only orchards today in northern Marion County are in the area of Alma and Tonti Townships. There were orchards all around the Nichols Home, the acres on the northeast corner of Kinoka and Jones Roads in Foster Township. There was also an Apple Orchard west of Sandy Branch School on Sandy Branch Road. 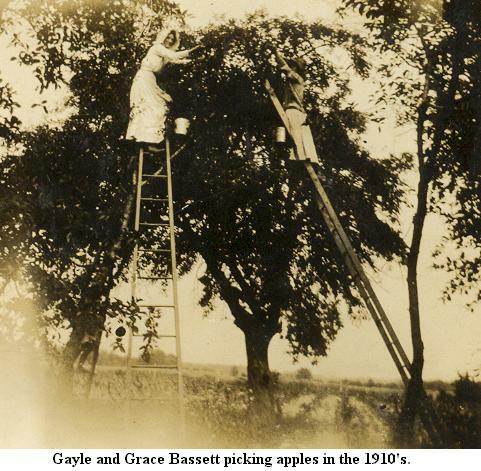 There was also an orchard on the Bassett Farm on Greenridge Road. There was at one time a Sorghum Mill in Foster Township. It was located on the north side of Sandy Branch Road, east of Garrett Road, just as you begin to go down hill. Nothing like Sorghum-Molassas on a homemade hot roll. We have a new crop in the township today. There are very few farms in the United States that raise horseradish. Foster Township is lucky enough to have one of them. Edward and Marilyn GERSTENECKER have a farm on McNicol Road, which many will remember as the Perkins Farm. I can vouch for the horseradish root they grow. I got some of the root last year and made it into some great horseradish. There is a story that Jesse James and his mother lived in the Inman house for awhile, hiding from the law. It was located in Section 22 near the Bassett's homes. This is Jones Land in 2003. If you turned west onto Sandy Branch Road, off of Garrett Road, and drive to where it turns south, keep going straight onto the dirt road instead of the hard road. Looking at the wood on the north of the field, that is where the house was. There were a lot more trees around there back in the old days. The validity of this story is not known. Religion has always played a major role in the lives of the people of Foster Township. The first church built n Foster Township was located in the town of Fosterburg. In 2003 there are only two churches in the township. One is Wesley United Methodist Church. Wesley was the result of Arnold Chapel burning in 1960 and the people of the congregation combining with the people of Zion to build a new church. It was built in 1960 in Section 20 on the Kinoka Road. It is a very nice stone building with a meeting hall on the back called Wesley Hall, which is used for church socials, community socials and for voting and township meetings. The other church is Green Ridge, but not the original, which was located across the road on the north west corner. The one now is located in what use to be the Green Ridge School. Its official name is Green Ridge Bible Missionary Union Church. It was founded in October of 1956. It is on Bilek Road and Green Ridge Road. Green Ridge School (Section 35). The two school buildings still standing are Green Ridge, which is now being used as a church. 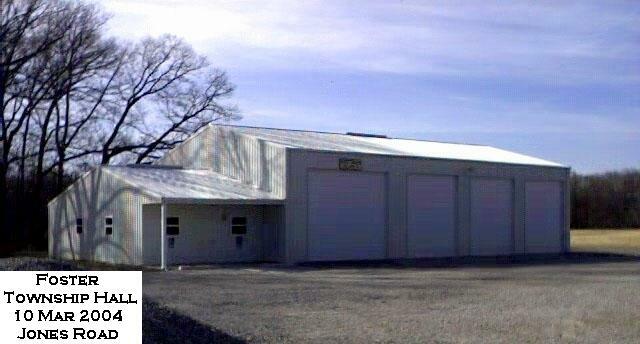 The other is Sandy Branch, which is used by the owners of the old Milburn "Mub" and Gayle (BASSETT) JONES Farm. It is located in Section 23 on the south side of Sandy Branch Road, where Albert Road meets Sandy Branch Road. In 1941, Sandy Branch held its first Ice Cream Social. Two years were missed. One during World War 2, 1945, and then the year 1987 was missed, but other than that, it was held annually through 2003. The ice cream social was held in order to get funds for the upkeep of the cemetery. Besides purchasing the ice cream, people would usually make their annual donations to the cemetery at that time. In the early 1967, Marjorie (CONANT) JONES began making hot dogs and beef Sloppy Joes to serve at the social. That made it so that people could eat their dinner and dessert at the social, thus the social was often referred to as the Sandy Branch Ice Cream Supper. In the 1990's, Fleta (CONANT) LYBARGER and her sisters, Elma (CONANT) WALKER, Valinda (CONANT) PRATT and Nellie (CONANT) FISHER, took over the food making. Then in 2004, because of federal regulations, which made the making and selling of any kind of food without having running water illegal. Sandy Branch did not have running water and had to stop the ice cream social. So for 5 years there were no Sandy Branch Ice Cream Socials. On Saturday, 19 Sep 2009, the social returned. Thanks to the organization of Fleta (CONANT) LYBARGER, the ice cream social was back. She organized it for the purpose of making enough money to get a military memorial monument for the cemetery. One that would hold all of the names of anyone buried in the cemetery who had served in the military. The money was made that first year and the decision was made to once again make it an annual ice cream social. They had to bring in a ho-made ice cream vendor to do the ice cream. Fleta and her son, Sean LYBARGER and family did the cooking for the supper, which included bratwursts, beef franks, BBQ smoked pork loin, baked beans and smoked cabbage. They were helped out by the MOUNT family. Brenda MOUNT made and donated a quilt for raffle. There was also music there, provided by the Bill HAWKEY Band and by Edgewood Country Opra. The money made at the socials will go to different projects at the cemetery. The year 1991 brought the naming of all the roads in the township in conjunction with the E911 phone numbers. They were named mostly for the people of Foster. Photos of some of the families of Foster Township, Marion County, Illinois. This Great Site has info on the Arnold, Bassett and Garrett Families of Foster Township. Our Sandy Branch Group has photos, maps, family histories, etc. The Marion County Index page has all of the links for our Marion County web pages. Type in a Yahoo ID, which will be your email. I use the same one for my Yahoo as I do for my other email. It makes it easy. Type in a password that you will remember. You are really missing out on a lot of information by not having a Yahoo ID. We have so many genealogies in our Sandy Branch, Kinmundy, Patoka and Salem Yahoo Groups, not mention photos, obituaries, maps, etc. And, you can post your own genealogies, photos, etc. in the group.